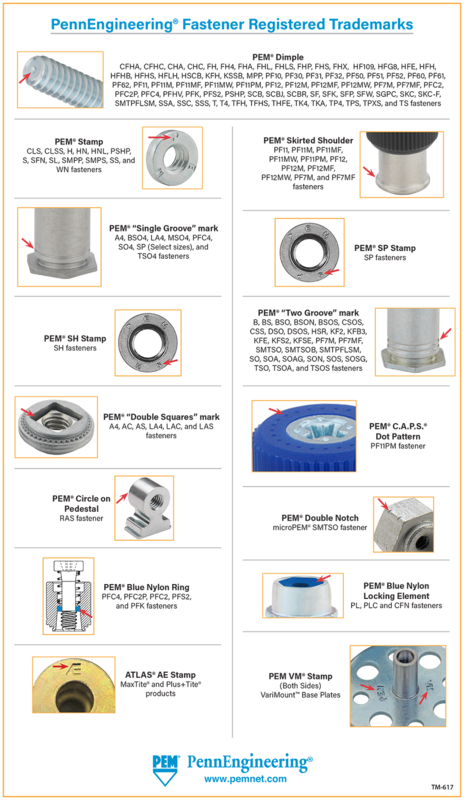 To ensure quality look for the PEM fasteners Trademarks. To help most are marked by registered trademarks. "PEM" or "one or two groove" trademarks in internally threaded fasteners and 'recessed dimple" on the ends of studs. Genuine PEM® brand products can only be purchased from authorized distributors such as Engineered Fastener. - Provide mounting hole of specified size for each fastener. - Make certain that shank (or pilot) is within hole before applying installation force. - Apply squeezing force between parallel surfaces. - Apply sufficient force to totally embed clinching ring around entire circumference and to bring shoulder squarely in contact with sheet. For some fasteners, installation will be complete when the head is flush with the panel fasteners surface. - Install steel or stainless steel fasteners in aluminum panels before anodizing or finishing. - Debur mounting holes on either side of the surface before installing panel fasteners - deburring will remove metal required for clinching fastener into sheet. - Install panel fasteners closer to edge of sheet than minimum edge distance indicated by manufacturer - unless a special fixture is used to restrict bulging of sheet edge. - Over-Squeeze. It will crush the head, distort threads and buckle the sheet. Be certain to determine optimum installation force by test prior to production runs. - Attempt to insert panel fasteners with a hammer blow - under any circumstances. A hammer blow won't permit the sheet metal to flow and develop an interlock with the fastener's contour. - Install the screw in the head side of fastener. Install from opposite side so that the fastener load is toward sheet. The clinching force is designed only to hold the fastener during handling and to resist torque during assembly. - Install panel fasteners on pre-painted side of panel.